A majestic landmark that sits on LI Sound overlooking Charles Island. Fort Trumbull is one of the most beautiful beaches on the CT shoreline with access to your own private beach. This property enjoys breathtaking sunrises, expansive views of the sandbars & active sailing/boating harbor. This 1895 architectural structure with its manicured lawn & sweeping views is reminiscent of a Newport Mansion. Interior boasts high ceilings, marble foyer w/European wall art, massive original carved pillars & a grand open stairway. Modern kitchen has top of the line appliances, 9 ft granite island & abundance of storage. A dream kitchen made for entertaining! Versatile & spacious floor plan is open to breathtaking views from every room. LR/FR has built in sofas, FP, surround sound, custom cabinetry & original crown molding throughout. 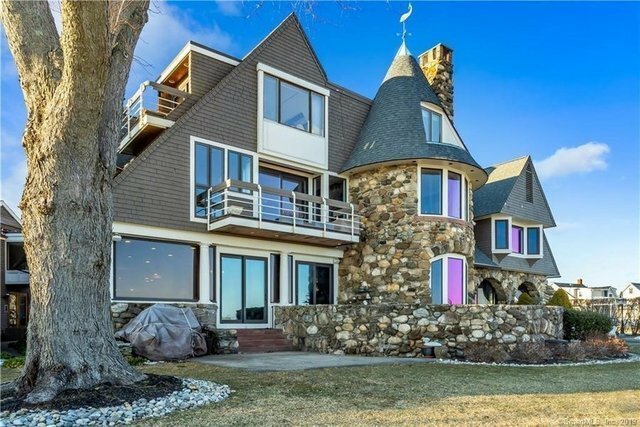 Large DR w/Alabaster sconces, custom wall art & wood paneling leads into unique round turret room with FP & views of Harbor. 2nd level features MBR suite w/FP, french limestone tile bath, soaking tub & open shower - AMAZING VIEWS!! Additional BR and modern bath are open to a large sitting room. possible 3rd BR. Sorry, no pets allowed per association bylaws. A unique & rare piece of Milford's History that can not be duplicated!